View Poll Results: What Horsepower outboard do you have ? What Horsepower are you running with your DINGHY and what do you think the IDEAL OUTBOARD would be ? I have 25, there isn't a choice available for 25. An oversight on my part, sorry, but you can "water ski" with that one, right ? I have no idea, we haven't tried. We wanted to able to plane with 4 adults + stuff. This is slightly off-topic, but, the Johnson Outboard line is done for. Evidently, Bombardier Recreational Products (BRP) has finally ceased building Johnson branded outboards. BRP will be focusing all of its efforts on Evinrude branded E-TEC engines. The Johnson Light Twin (Sea Horse) outboard was first introduced at the 1922 New York Motor Boat Show, and (Johnson) was once the best-selling outboard brand in the world. 11' Hard bottom Alliance inflatable with an 18hp 2 stroke. We love it. Fast, very stable and planes with 4 adults. We do have lifters on the stern and the foil gizmo on the lower end which I modified slightly. No 18hp on the vote list. I have a 2 horsepower Honda. I wanted lightweight. I would have bought a 2 stroke if one had appeared in the used ads before the Honda. But a bout JOHNSON OUTBOARDS, that's amazing and SAD! I remember (50 years ago) my Dad always had a Johnson, I think our first was a 25hp that was HUGE! Men and their "JOHNSONS" WILL NEVER BE THE SAME !! A big factor here that isn't mentioned is the weight and size of the dinghy... Our neighbor has a 12' Caribe dinghy with a 40hp engine, but it has a full console and weighs over 400 lbs! WEIGHT would be very informative, also! That's why I really want a 5hp or 6hp..... I'm in NO hurry! Weight is one of the reasons we were SO happy to get an old fashioned, low-tech, gas guzzling 2 stroke! I love efficiency, but give me a simple and lightweight 2 stroke any day for the tender. Honda and Yamaha four-strokes. We have a fleet of five Boston Whaler type boats used for research that are from 12 to 22 feet in length. These boats get a lot of use, probably a lot more than the typical cruiser gives their dink. We stopped buying American outboards because they were so unreliable. I'm sorry we could not keep up with the Japanese. All the maintenance is done professionally and on schedule including a required fresh water flush by the boat skipper after each use. Even with proper maintenance, the Japanese engines are more reliable. I would never consider a Johnson/Evinrude or a Mercury. Interestingly, we were in the market for a new Boston Whaler but when we found out we could only buy it with a Mercury, so we looked for a used Whaler without an engine and put a Yamaha on the boat. I don't know why Boston Whaler cripples their sales with this mandatory Mercury engine idea. I found it handy to carry 2 OB. 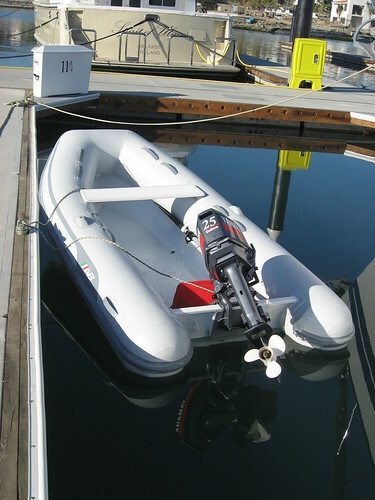 I use my Suzuki 2HP as my tender OB for going back & forth at anchor. I also have a 15HP Yamaha for exploring. I have to be honest though, I seldom used my 15HP. I found it too difficult to handle (I am 6'4" 225#). When cruising, one must take your physical condition very seriously. Often times (more than not) we found ourselves in far away, deserted areas. If we were to hurt ourselves, it could be a real problem. Let me tell you, taking that big OB off the stern of the yacht was an easy way to get hurt. I could handle the 2HP (22#) with one hand, while standing in the dinghy. I have actually towed my (20 ton) yacht with the 2HP also (at 3kts). Can I ask...don't most cruisers have transom davits so they don't have to lug an engine on and off a dink each time they use it?